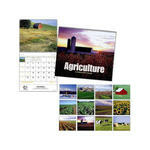 Calendars promote your company name all year long. They increase brand awareness every time the owner views the calendar. Choose from our many different scenery options including agriculture, gardens, cities and many others. We can even create a custom calendar in a shape that represents your company’s brand.